Ambala is a city and a municipal corporation in Ambala district in the state of Haryana, India, located on the border with the Indian state of Punjab and in proximity to both states capital Chandigarh. Politically; Ambala has two sub-areas: Ambala Cantonment also known as (Ambala Cantt) and Ambala City, approximately 3 kilometers apart, therefore it is also known as "Twin City". It has a large Indian Army and Indian Air Force presence within its cantonment area. Ambala separates the Ganges river network from the Indus river network and is surrounded by two rivers – Ghaggar and Tangri – to the north and to the south. Due to its geographical location, the Ambala district plays an important role in local tourism, being located 47 km (28 miles) south of Chandigarh, the state capital, 148 km (93 miles) southwest of Shimla, 198 km (121 miles) north of New Delhi and 260 km (155 miles) southeast of Amritsar.Gurudwara Manji Sahib is situated in Ambala. It is said that Ambala District was founded by Amba Rajput during the 14th century CE. Another version is that the name is a corruption of Amba Wala meaning the mango-village, from mango groves which existed in its immediate neighborhood. Still, another version is that the District has taken its name after goddess "Bhawani Amba" whose Temple still exists in Ambala city..In 1709, Battle of Ambala was fought and Sikhs captured Ambala from mughals. 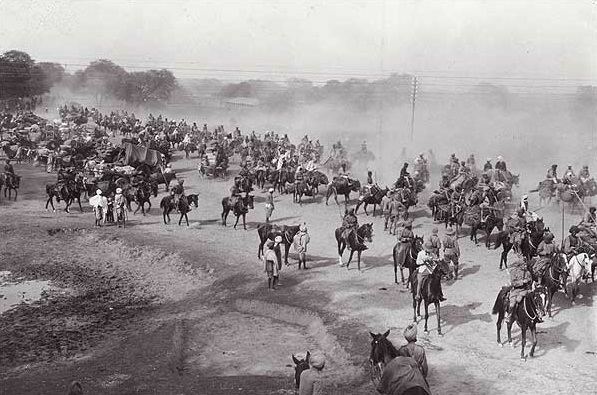 Ambala Cantonment was established in 1843 after the British were forced to leave its Karnal Cantonment following the malaria epidemic of 1841–42 in as there were not any known effective means to control malaria epidemic in those days. The cantonment houses the '2 Corps', one of the three Strike Corps of the Indian Army. Ambala Cantonment is location of historic Ambala European Cemetery. Ambala Air Force Base is one of the oldest and largest airbases that were inherited from the British by the IAF. It was from this airbase that Spitfires and Harvards flown by Instructors of the Advanced Flying Training School took part in the 1947-48 Kashmir Operations. Subsequently, Ambala was the front line airfield for many years. It was home to various aircraft that were inducted into the Indian Air Force. Vampires, Ouragans, Hunters, etc. all flew from this base. The airbase was briefly attacked in 1965 by B-57 bombers of the Pakistan Air Force. Today, the Airbase houses the '7 Wing' with squadrons of Jaguars and MiG-21 Bisons. A unit of the French-made Dassault Rafale will also be based at Ambala air base. As of 2011 India census, Ambala UA had a population of 207,934 consisting of 112,840 males and 95,094 females, a ratio of 843. there were 20,687 children 0-6 and Ambala had an average literacy rate of 89.31%, with 91.76% of males and 86.41% of females literate. Ambala is known as city of scientific instruments. It is a major scientific products market and is a hub for products like glass apparatus, microscopes, laboratory equipment etc. Ambala contributes nearly 34% of the total production of scientific instruments produced in India. Ambala is connected to all of the other major cities of north India including Delhi, Chandigarh, Amritsar and Shimla. It is a big interchange for various commuters for all neighbouring states. The Ambala Cantt bus stand witnesses roughly 50,000 commuters daily. Bus service is the major means of public Transport in this district. Ambala depot came into being on 1.8.1950. The office of the General Manager is situated in the premises the depot workshop at Ambala City. Ambala depot has a sub depot at Naraingarh.